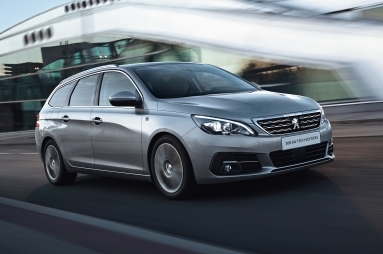 The PEUGEOT 308 has been upgraded with a new Tech Edition trim level, making use of a wide range of technology and advanced driver assistance systems to maximise customer appeal. The specification, which carries a £1,450 price premium over existing Allure trim, includes a Drive Assist Pack, Safety Pack and PEUGEOT Connect SOS and Assistance. Drive Assist Pack features Adaptive Cruise Control and Automatic Emergency Braking, while the Safety Pack adds Driver Attention Alert, PEUGEOT Smartbeam Assistance, speed limit recognition and recommendation, Active Lane Keeping Assistance and Active Blind Spot Detection. Comfort and convenience is improved with the addition of LED front interior light with reading spotlights and rear interior light with timer, front and rear parking sensors, City Park, colour reversing camera, power folding door mirrors with courtesy approach lighting, a rear central armrest with ski flap and two cup-holders and automatic dual zone climate control. 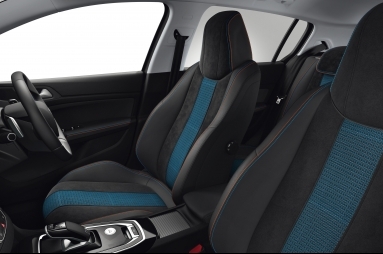 The Tech Edition also brings interior changes including aluminium style pedals and door sill, front passenger seat lumbar adjustment, Alcantara® seats with double overstitch details in orange and Tech Edition blue and sports style front seats with elongated cushion bases and increased side support. On the outside, Tech Edition brings chrome side window trim and radiator grille, aluminium door sill finishers, a panoramic fixed Cielo glass roof with electric blind, halogen fog lights, 17" 'Rubis' diamond cut alloy wheels and aluminium longitudinal roof bars for the SW model. 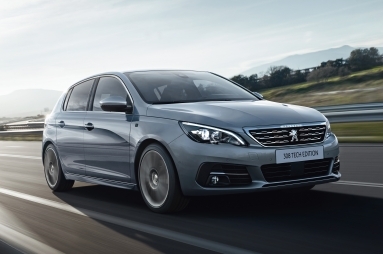 PEUGEOT 308 Tech Edition is available in hatch and SW form with 1.2-litre PureTech 130 S&S or 1.5-litre BlueHDi 130 S&S engines twinned with either a 6-speed manual or EAT8 automatic gearbox. Available to order now, prices start from £22,400 for PEUGEOT 308 Tech Edition.